Home > Causes > Does Using Electronic Devices Cause Headaches? Headaches are a very common health problem; most people have a headache during any one year period of their lives. It is the most frequently cited symptom in teenagers and young adults. Parents often lay the blame for this firmly at the door of electronics. Most teenagers and young people are obsessed with watching TV, playing Playstation, X-Box 3, or Wii games, using mobile phones, computers, ipods or other mp3 players, watching DVDs and using digital cameras and photo frames. But is being surrounded by all of these electronic gadgets and using them so often really causing headaches? Few studies have looked into this but one that reported recently looked at the association between using electronic devices and the frequency of headaches in just over 1000 people aged between 13 and 17. It confirmed that the use the young people make of electronic media is so much greater than ever before in history and gaming, listening to music, using mobile phones and computers are all top of the list of favourite activities. The researchers asked the teenagers in the study to note down how often they used each type of electronic device and for how long and asked them also to record when they experienced any sort of headache, including tension type headaches or more severe migraines. The researchers then used the questionnaire to carry out a one-to-one interview with each of the young people who participated in the trial. Surprisingly, no association at all was found between using any particular electronic media and an increased risk of headaches. It was also a surprise to find that, although 85% of the teenagers used a computer (some even for homework...), over 90% watched TV on a daily basis and 90% listened to some type of music, the usage of mobiles and game consoles were less than expected. Only 23% of those questioned used a mobile every day and a quarter of the teenagers reported gaming each day. Does Listening to Music Cause Headaches? The study did show a positive correlation between the habit of listening to music everyday and having a headache, but this doesn’t mean that the association is a causal one. With this type of study, which is regarded as very small in terms of its statistical power, it is difficult to use the results to make more than interesting observations. One possibility that the researches could not rule out was that teenagers who were prone to headaches, relaxed while listening to music as a way to cope with their headaches. The researchers did show, however, that at least two hours each day of loud music was almost bound to set off a headache, whether it was played through ear phones or not. Even though this particular study provides no evidence that using electronic media is linked to headaches, that doesn’t mean that it’s completely OK from a health point of view. 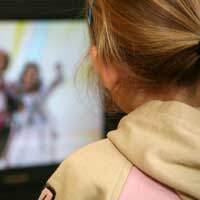 Young people who watch TV, DVDs or sit at a computer in preference to socialising or doing active things like sports, exercise, are more likely to be overweight. This is partly due to not getting enough exercise but also because watching TV is particularly liable to cause extra snacking and drinking – even if it is only high calorie sugary drinks. Too much concentrating on moving images on a screen can also lead to eye strain, which can cause headaches, and is known to make it more difficult to sleep. As with most things in life, balance is important. Teenagers are not going to give up all electronic media overnight, but it is sensible for us all the think about why we do various activities. Is using a computer to randomly surf the internet, or watching a boring TV program the result of boredom or dissatisfaction? It is hard to break habits but getting out a couple of evenings a week, or for an hour or two at weekends and doing something active can only improve health in the long term.